KoopaTV: Dragon Ball FighterZ Open Beta on Nintendo Switch... could use some work. Alright, so the controls aren't all available in one place, and if you want to play as anyone but Goku, the Open Beta doesn't give you a read-out on all of the moves of all the other characters. 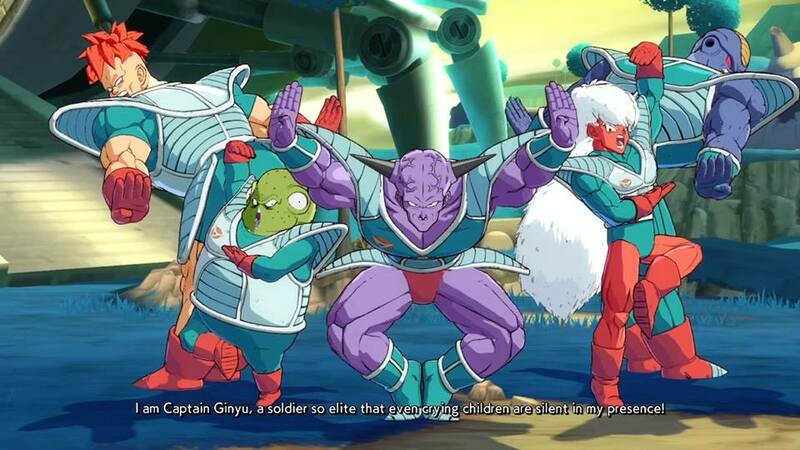 Since Dragon Ball FighterZ operates in teams of three, you'll be going blind for at least two-thirds of your roster. 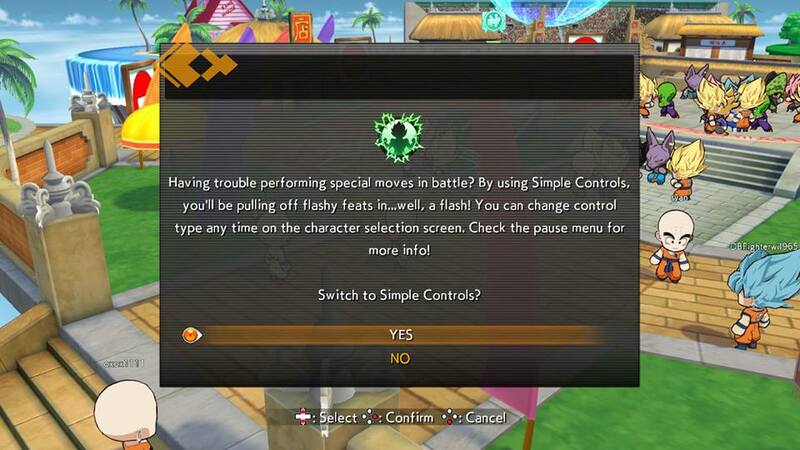 And when you're trying to figure out the normal set of controls, the game has this Simple Controls pop up. Since they don't explain the normal controls, they also don't explain how Simple Controls simplifies the controls. Let's suppose you figure out how to play. You need to figure out how to actually get into a match. There are Ring matches and Arena matches. The latter seems complicated and it is poorly explained what the hell it is, so I went into Ring matches, which are mini-lobbies of 8 people within a room's 64-person lobby. Then you need to non-intuitively figure out how to go from the mini-lobby to a match. Once you figure that out and go through the vague status messages as you wait for a battle, it's time to play! You can win entire matches by just spamming Ki Blasts with the special (B) button, since they stun-lock your opponent from across the stage. You're supposed to block, I guess, or do that Vanish attack once you build up enough of the Ki metre. (The aggressor gains more than the defender.) You're supposed to somehow jump in-between Ki Blasts and then air-dash towards your opponent, but the Nintendo Switch Pro Controller isn't good at pressing a direction twice very quickly on either the Control Stick or the Directional Pad. Eventually, a Goku will go down, and then you don't know how to play. For example, I play as Nappa, but I don't know how to summon the Saibaman that the CPU Nappa was using in the tutorial, which is... rather critical for him to be viable. There isn't any way in the Open Beta to look this up. You gotta look at some online tutorials. I also have Captain Ginyu to finish off the team of three, because his force seems very... familiar to me. The full version of the game, and a hypothetical demo (reminder that this is not a demo), would probably have Practice available and you could do it offline. But, again, it's an Open Beta. They're testing servers. The servers are overwhelmed. At least this should prove that people are interested in the game and Bandai Namco should've listened to us a year ago in terms of putting Dragon Ball FighterZ on the Nintendo Switch at all! Ludwig doesn't have much fighting game experience outside of the Super Smash Bros. series, where he has accumulated thousands of hours but basically none of it transfers to this game. Ludwig doesn't know if he wants to actually buy the game based on this Open Beta. Probably not, since this doesn't leave a great experience. He thinks it's smarter to educate the market with a real (offline) demo first, and then do a stress-test online beta after. I think it's safe to say this one's not going on the monthly top 5. And frankly, I'd be surprised by a new game's servers NOT being overwhelmed. It just seems to me like nobody bothers to get properly ready for that kind of thing in that industry, in the same vein of how expensive it would be to upgrade the levies in New Orleans. Dragon Ball FighterZ releases next month in September, though at the very end of the month. Not sure what competition it'll have to be in the top 5. Obviously, the... Oh, you mean the KoopaTV newsletter's top five articles. We'll see. Anyway, the point of the beta is to test the servers, so this beta is how they're getting ready for the release. That's fine. Not my complaint in the article. My complaint is that, for player enjoyment, they should've released a demo first.